Due to a small mix-up over scheduling, I deviated from my normal convention schedule this year. This ultimately lead to me attending KokomoCon in Kokomo, Indiana over the weekend. I’d like to describe the experience here. KokomoCon is a small show, with about 1000-1500 people. It’s also a one-day show, of which I am not normally a fan. Still, two of my friends spoke highly of the show, and a third friend asked me to attend. I decided to give it a try. Unlike most of the conventions that I attend, KokomoCon was was not predominantly game-themed. This made it difficult for me because my product tends to gel well with the needs of gamers. For example, at Origins or GenCon, I can often strike up a conversation with a customer by asking “What do you play?” As we talk, I get a chance to learn about the player’s experience, but I also get a chance to talk about how I can potentially enhance their gaming experience with artwork. If they have characters that they have played for a long time, I can make their character for them to drop into their character sheets. If they are game designers looking for artwork, I can potentially match some of my work to their themes. Either way, we work through the creative process together. At comic conventions, or even “all things geek” expos like this KokomoCon, I get a lot of “I don’t play games” in response to that opening question. This isn’t a bad thing; it’s just that the fans are looking for something different. I can generally still strike up a conversation. The problem is that, while I can talk intelligibly about Manga, comics, steampunk, etc., it’s hard to spark their interest when the product they want isn’t one that I make. This leaves me with the decision of either sticking to just game-related shows OR expanding my portfolio to include things like superheroes and other trademarked characters. The latter of these two choices makes me squeamish, but I won’t go into that today; I’ll write more about it next week. That said, I don’t think the difficulties that I had with the show were the fault of the show’s organizers; I think it was just an oil-water issue of my content vs that market involved. Organization – One of my friends at GenCon told me that KokomoCon was one of the best organized shows she had ever attended, and I would have to agree. The process for getting signed up for the show was simple, and the booth was exactly as I expected on the day of the show. Promoter feedback – KokomoCon doesn’t have the history of a lot of the bigger conventions, so the promoters of the show are still continuously seeking feedback. This is a good thing; it shows they have an open mind. They individually came around to invite the vendors back for next year’s show, and solicited responses on how they could make the show better. 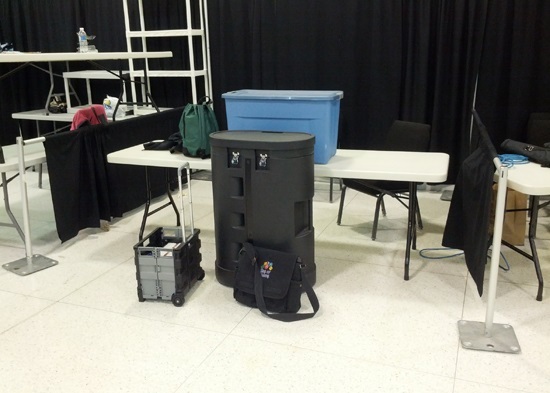 Large space – as a vendor, this was both a good and bad thing. It was good because it shows that the venue has room for the growth of the show. Unfortunately, it also made it easier for people to just blow past the booth. At more congested shows, people will often stop to look at – and potentially buy – artwork as they are waiting to get through. This was one of the things that I liked about BashCon, and I hope to see at future shows. Seeing friends – As I said, a friend asked me to come to the show, and was gracious enough to put me up the night before. This connection is half of the reason why I attend the conventions, so I still got a lot of value out of it. Streamlining of my own processes – As I said above, I am not a fan of one-day shows. I strike up a lot of conversations during shows, and a lot of my sales come from people just coming back to talk throughout the weekend. About half-way through the day, I realized that this setup was actually perfect for my 4-day shows, and that I had been taking too much to the other shows. By trimming down on my gear, I was able to pack and unpack much faster than normal. This isn’t normally a big deal, but it can be huge if I ever travel to a show with someone else (hurray for carpooling!). So, everything considered, KokomoCon was a good experience. If you are a comic artist or toy vendor, I would definitely recommend the show. There’s money to be made there. If you are an up-and-coming artist, I would encourage you to try it just for the one-day experience. By the way, there was one more interesting things about the show: unlike most shows that I attend, the floor at KokomoCon was not carpeted. A smooth, hard floor combined with generally open space led some of the cosplayers wear roller skates. The first time I saw this, I was disoriented by the person moving toward me in a smooth, straight motion that was inconsistent with her leg movement. This caused a me to experience a vertigo effect that almost knocked me out of my chair.